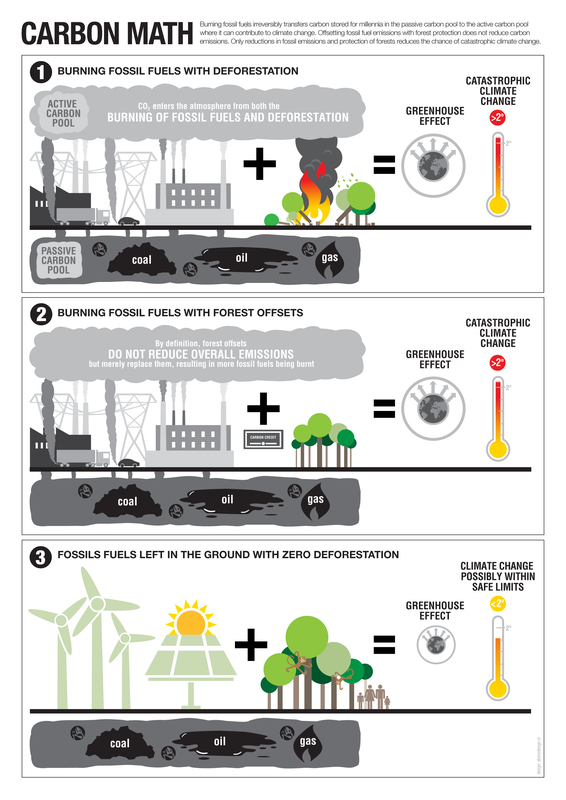 To coincide with the COP19 UN climate negotiations in Warsaw, Greenpeace has released a short briefing explaining why forests cannot offset fossil fuel emissions. The briefing is a very clear explanation of the fundamental difference in terms of climate change between the carbon stored in fossil fuels and the carbon stored in trees. Greenpeace’s briefing can be downloaded here (pdf file, 196.4 KB). REDD as a carbon trading mechanism assumes that a ton of carbon not released from forests is the same in terms of the climate as ton of carbon emitted by burning fossil fuels. As Greenpeace explains, this assumption is wrong. The fossil fuel industry frequently argues that emissions caused by burning oil, coal and gas or other fossil carbon could be made up for by forest conservation. Using forests as an offset, the argument goes, would allow industry to keep emitting without having any detrimental effects on the climate. This briefing explains the flawed logic behind that argument. There are countless reasons to protect forests but using them as a carbon offset mechanism for emissions from fossil fuels is not one of them and will not save the climate. Recent estimates suggest deforestation is responsible for about 10 to 15% of anthropogenic – or manmade – carbon dioxide (CO2) emissions. Consequently, stopping deforestation is a crucial component in achieving the dramatic emission cuts we need to make in order to avoid catastrophic climate change. Offsets, by definition, do not reduce overall emissions but merely shift them from one place to another. In addition to that the unique characteristics of forest carbon (explained below), illustrate that it is impossible to replace fossil carbon with forest carbon. Taken together this makes it mandatory that reductions in deforestation are in addition to, and not instead of, cuts in fossil carbon emissions. The active carbon pool or “biosphere” is made up of all carbon that circulates between the atmosphere, land and oceans. Only carbon in this pool can actively contribute to climate change. The passive carbon pool or “lithosphere” comprises carbon that has been buried underground for several million years (for example, as coal, oil or gas). Carbon in this pool does not contribute to climate change as long as it is not transferred to the active carbon pool. Plants, and in particular woody plants such as trees, contain carbon. When these are cut down, for example by deforestation, this carbon is released into the atmosphere where it contributes to climate change. Protecting the world’s forests is therefore crucial to maintain as much of their carbon as possible locked up. At the same time, however, it is important not to increase the overall amount of carbon in the active pool because it is ultimately the size of this pool that is critical for climate change. The bigger the active carbon pool is, the more CO2 is in the atmosphere, contributing to climate change. Stopping the increase of carbon in the active pool can only be achieved by reducing and ultimately stopping the burning of fossil carbon. Burning fossil fuels almost irreversibly transfers carbon that was stored for millions of years in the passive carbon pool to the active carbon pool. As a consequence, there is more carbon available to be in the atmosphere, where it enhances the natural greenhouse effect and gives rise to climate change. This means that fossil carbon and forest carbon are not interchangeable. A tonne of fossil carbon is not the same as a tonne of forest carbon. Increases in the release of the former cannot simply be made up by decreases in the release of the latter. Using forests as an offset option creates the false impression that we can continue to burn fossil fuels if we just reduced deforestation when in reality we are turning passive carbon into active carbon that will further increase the already dangerous CO2 concentrations in the atmosphere. Proponents of forest offsets often suggest that trees could actually replace a substantial part of the carbon that is released by burning fossil fuels. This claim, however, is not backed by climate science. 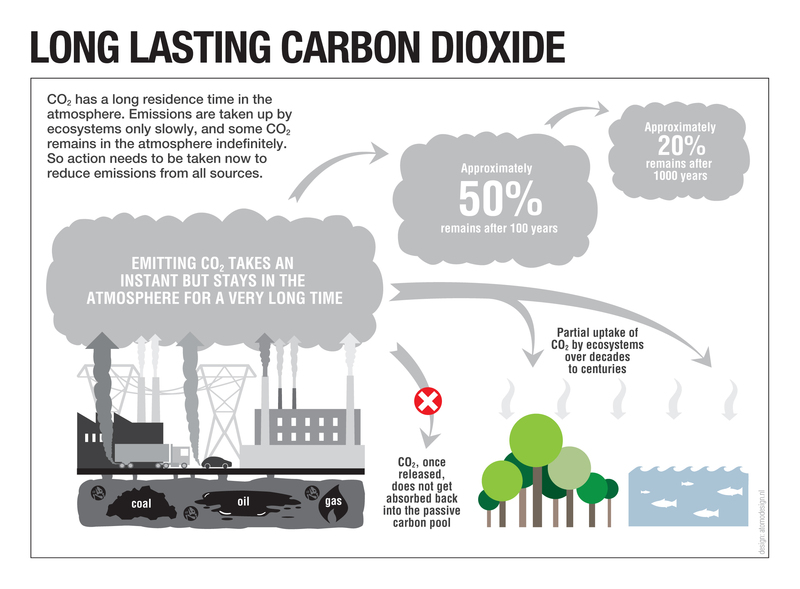 Carbon dioxide emissions – independent of their source – enter the atmosphere immediately. The removal of CO2 from the atmosphere, on the other hand, takes much longer, with several processes operating over different time scales varying from decades to millions of years. Although complex, all models by climate scientists show a long “tail” for the period of time that CO2 remains in the atmosphere. This is also referred to as “residence time of atmospheric CO2”. The residence time models used by the Intergovernmental Panel on Climate Change (IPCC) estimates that, within a few decades, 15 to 25% of CO2 emissions that enter the atmosphere are taken up into the landmass (mostly by trees), with a similar proportion absorbed by the oceans over the same timescale. An additional 30% of emissions will be removed within a few centuries, and the remaining 20% may stay in the atmosphere for many thousands of years. This means about half of mankind’s CO2 emissions remain in the atmosphere for decades or more. Thus, it is not possible to keep burning fossil carbon and expect forests or other parts of the biosphere to absorb the resulting atmospheric CO2. Even though both new forest growth and mature (old-growth) forests take CO2 out of the atmosphere, the process can only remove a portion of atmospheric CO2 and is much too slow to prevent the predicted changes to the world’s climate. This renders forests inherently unfit as an offset option to allow the continued burning of fossil fuels. Given the urgency of addressing climate change, immediate reductions in CO2 emissions are required. Only bold action that tackles deforestation and reduces fossil emissions simultaneously can place us on a path to a sustainable future. Doing just one will simply not be enough. Burning fossil fuel instantly, and almost irreversibly, releases additional CO2 into the atmosphere. Forests, on the other hand, take up CO2 only slowly, and even then only a portion of fossil emissions can be taken up. Allowing forests to be used as offsets would set us on a trajectory of burning even more of the fossil fuels that we need to leave in the ground in order to avoid catastrophic climate change. Our only chance to stop climate change is to avoid carbon emissions from all sources, meaning that we need to ultimately end burning fossil fuels while at the same time protecting forests. Protecting forests is important not just for the carbon they contain, but also for biodiversity and the people they support. These processes occur over timescales ranging from months to thousands of years, making for a rather complex carbon cycle. Biospheric carbon is also termed “labile” or “mobile” carbon as it is taken up from the atmosphere by plants or the ocean, and then returned during processes such as the decay of organic matter. Archer D, Eby E, Brovkin V, Ridgwell A, Cao L, Mikolajewicz U, Caldeira K, Matsumoto K, Munhoven G, Montenegro A & Tokos K (2009) Atmospheric lifetime of fossil fuel carbon dioxide. Annual Review of Earth and Planetary Sciences 37: 117-134. Lewis SL Lopez-Gonzalez G, Sonké B, Affum-Baffoe K, Baker TR, Ojo LO, Phillips OL, Reitsma JM, White L, Comiskey JA, Djuikouo K MN, Ewango CE, Feldpausch TR, Hamilton AC, Gloor M, Hart T, Hladik A, Lloyd J, Lovett JC, Makana JR, Malhi Y, Mbago FM, Ndangalasi HJ, Peacock J, Peh KS, Sheil D, Sunderland T, Swaine MD, Taplin J, Taylor D, Thomas SC, Votere R & Wöll H (2009) Increasing carbon storage in intact African tropical forests. Nature 457: 1003-1007. I do not buy your logic. Simply because if we act on this advice then with the current opportunity costs all forests will be gone. Lenin once said ” I will hang the capitalist with the same rope he sold to me” so in the real world it is only $ attraction that can lure states to save forests, and REDD is that rope unless an ideal world is created. Despite this seemingly good analysis, it appears that Greenpeace still fails to grasp the fundamental truth concerning the difference between real forests and man-made tree monocultures, and this undermines what could otherwise be an admirable position. ‘Fake Forests’ or industrial timber plantations have been demonstrated to be net emitters of CO2 due to their intensive fossil energy requirements for pulp-wood and timber production in-field, transportation and processing of logs, and that then go on to become polluting non-recyclable toilet tissue, disposable diapers (nappies) that rot in garbage dumps or rivers; and of course as “renewable biofuels” in the forms of wood pellets, charcoal or methane, that when burned produce just as much CO2 and other greenhouse gases as the fossil fuels they replace. When considering the above, it is not very surprising that the market for ‘fake forest’ carbon emission offset credits in the form of both the CDM “Certified Emission Reductions” (CERs) as well as “Verified Emission Reductions” (VERs) in the so called “voluntary” carbon market, has all but collapsed, while becoming fertile ground for criminal schemes to sell the worthless credits to gullible ‘investors’. It may also explain why support for REDD+ projects has been so poor apart from politically motivated funding from the governments of countries such as Norway and Germany. However, despite the obvious reality that timber plantations, usually of invasive exotics such as Sitka Spruce, Pinus spp. or Eucalyptus spp., are just a form of temporary industrial agriculture, like tobacco farming, Greenpeace continues to actively support the Forest Stewardship Council (FSC) system of certifying ‘fake forest’ monoculture tree plantations as ‘responsibly managed forests’. This especially so in industrialised countries like the US and Canada, as well as in the EU, including the Nordic countries, where large areas that were originally under real forests have been systematically logged and converted to industrial tree monocultures over the past 100 years. From this it appears that Greenpeace may have a double agenda: Opposing the offsetting or trading of forest carbon against industrial greenhouse gas emissions; but tolerating or perhaps even supporting the replacement of forests and other natural habitat such as grasslands with vast “green blankets of death” as industrial-scale tree monocultures have been so aptly described. Such monocultures directly destroy or damage biodiversity, displace rural communities from their traditional lands, and cause untold suffering and hardship as Indigenous Peoples and other forest dependant communities are either forced to migrate to festering city slums, or become virtually enslaved to the new corporate owners of their land as lowly paid contract labourers. This anomaly illustrates the clear contradiction between Greenpeace’s apparently positive position against offsetting forest carbon against industrial fossil-fuel combustion emissions, whilst explicitly supporting dubious timber plantation industry claims of their ‘sustainable management’ of the natural resources – land, water, vegetation and wildlife – that their tree plantations actually damage or destroy. Also, given that the Pulp, Paper and Packaging industrial sector has been rated as the third highest source of greenhouse gases globally, it must surely be a mistake for the FSC to certify timber plantations that do so much social and environmental harm as “Ecological and socially responsible forests” as described on Greenpeace’s website. Surely if there is any “Flawed Logic” that needs to be addressed, it must be that of Greenpeace? I have studied forests in the southern half of Sweden the monoculture of Spruce planting is becoming increasingly of concern. As usual it fetches the highest price per hectare which is the sole drive from forest logging companies. However the long term implications (not that long)is the spruce is a parasite that outgrows and kills all native deciduous trees. The canopy excludes all light to the forest floor. It grows in semi darkness where as deciduous do not, seeds blow further and amid all struggling sap root growths and blot out and kill all other types of trees. The soil also becoming acidic due to spruce needle infestation of the forest floor has further implications in killing of red species and aqua plants in streams and their tributaries into lakes and rivers. Extreme regular labour intensive attacks on the forest inhabited by spruce can slowly win back the forest land but a further worry now is the monoculture of spruce plantations is also being fertilised by chemicals to promote growth even faster. GM spruce saplings for planting is probably already here! We will then soon be seeing organic wood for sale and chemical wood for sale, just like chickens and carrots! But to what long term effect on the Environment let alone the fat future of Mankind!